swing-away removable footrest is a versatile, economical wheelchair designed to provide you with worry-free comfort and dependability. Padded armrests provide the comfort and support of an armchair and durable nylon upholstery is easy to keep clean. You'll love the handy spacious cargo pocket located behind the chair's backrest. Store reading material, keys, billfolds and more. The Sport Wheelchair boasts urethane tires that require minimum maintenance and lend a smooth ride, plus push-to-lock brakes to put you in control. The attractive silver vein finish on powder-coated steel resists chipping and cracking, so your 18" wheelchair will stay looking fresh and new. Easily store your black wheel chair by folding it and tucking it away when not in use. It is important for the attendant to be familiar with proper assisting procedures in any situation that requires the use of the wheelchair. Safety is the Key consideration. Consult your physician, nurse or physical therapist to determine methods most suitable for your individual needs and abilities. To open the chair, tilt to one side and push down on seat rails. To attach footrests, align the holes on the footrest arm with the pegs on the frame. To adjust the length of the footrests, loosen the bolt (or knob) on the telescoping tube shaft. Tighten securely after adjustment. The lowest part of the footrest should not be less than 2 1/2 inches from the ground to permit proper clearance. To move the swing-away footrest, release the lock. Swing outward and rearward. Simply lift up and off to remove the footrest. WHEEL LOCKS - Engage both wheel locks before getting in or out of chair, leaning forward in chair, or while in an elevator or wheelchair lift. Proper adjustment of wheel lock is at least 1/8” when locked. Locks are engaged by pushing handle completely forward. Adjustments to locks are made by loosening or tightening nut on the carriage bolt. Embed lock shoe at least 1/8” by sliding clamp toward rear wheel while handle is engaged in locked position. Tighten nut and bolt to secure in position. Test for correct locking action before actual use. TIRES - Solid rubber tires need minimal maintenance, but should be cleaned occasionally with a damp cloth. Replace if tires become severely worn or cracking appears. FRONT CASTERS - Casters should be checked periodically and lubricated occasionally. Lubricate by removing fork and greasing caster stem bearings. Lubricate wheel bearings by removing wheel from fork. Reassemble fork and wheel by tightening nuts until no play remains, but wheels roll freely. If nut is too loose, caster will shimmy, if too tight, chair will be hard to steer. 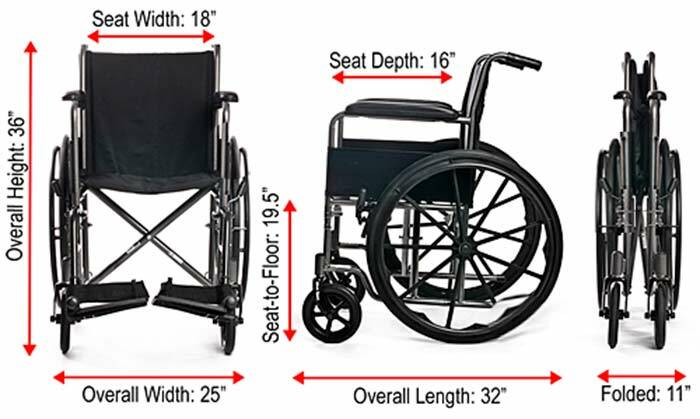 ADJUSTING LENGTH OF FOOTREST/LEG REST - When adjusting length of foot rests or leg rests, user should be sitting in wheelchair with feet on the foot plates. Loosen bolt on the clamp around support assembly. Raise or lower foot plate to desired position that will provide maximum support of thighs. Front rigging should not be so low that it causes uncomfortable pressure to thighs at front of seat upholstery. Footrest should not be lower than 2-1/2” from the ground to ensure clearance. ADJUSTING/ELEVATING LEG REST - Lift foot plate on leg rest assembly to desired position. Release leg rest assembly and it will automatically lock into place. To lower, push out on leg rest lever and lower foot plate to desired position. WHEELS - Large rear wheels should be inspected at least once a month to ensure proper tightness. If wheel wobbles or is loose, release lock nut and tighten axle bolt slightly. Test for proper tightness by learning chair to one side and spin adjusted wheel. GENERAL CARE- Wipe chrome parts with a clean, soft cloth at least once a week. All metal parts can be cleaned with auto wax or similar poducts. If exposed to moisture, dry immediately. Do not use an abrasive cleanser that will scratch the finish. TO OPEN CHAIR - Open wheelchair by tilting to one side and pushing down on seat rail until fully opened. TO CLOSE / FOLD CHAIR - First fold foot plates to vertical position. Grab seat with both hands at front and back edge and lift. Or, tilt chair to one side and lift up on seat rail. REMOVABLE ARMS - Remove arms by depressing spring button and lifting arms out of front and rear sockets. Stability - Wheelchair is designed to be safe and stable as long as center of gravity is maintained while going about normal activities. Care must be taken while performing activities that shift your center of gravity in the chair. Never reach so far that require you to shift in the seat or bend over out of the chair. When you have to reach for objects that require you to lean, be certain front casters are pointing in a forward position that extends the wheel base and will stabilize the chair. Ramps - Be sure of your own capabilities, limitations and strength before attempting to go up a ramp. Correct techniques on ramp negotiation should be shown to you by a qualified professional. Assistance is recommended when going up or down inclines greater than 10o. If you must stop on an incline, avoid sudden, abrupt movement when you resume movement. Because of backward angle of the chair, sudden abrupt movement could cause instability. Attempting to use the wheel lock brakes could result in accidental locking, tipping to one side, or cause a sudden stop. Avoid changing direction when going down an incline, as this could result in instability of tipping over. Do not attempt to adjust or operate wheelchair without reading carefully all instructions in this manual. This wheelchair has not been approved as a seat that can be used within vehicles of any kind. Always transfer wheelchair user to a vehicle manufacturers approved seat and use safety restraints available. 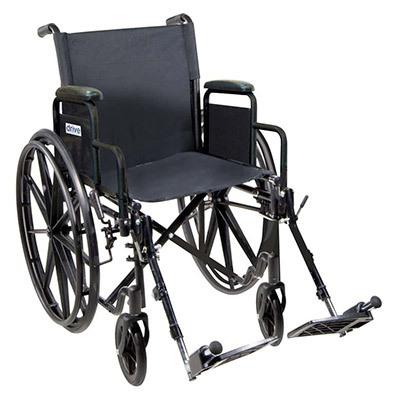 Do not operate this wheelchair on roadways, streets or any surfaces with vehicular traffic. Do not attempt to operate on inclines 10% or greater without proper assistance. Be sure to completely engage wheel locks when getting in and out of wheelchair or when in elevator or wheelchair lift. Wheelchair should be on a smooth, stable and level area with wheel locks engaged before transferring user in or out of wheelchair. Do not adjust foot rests any lower than 2-1/2” from floor. 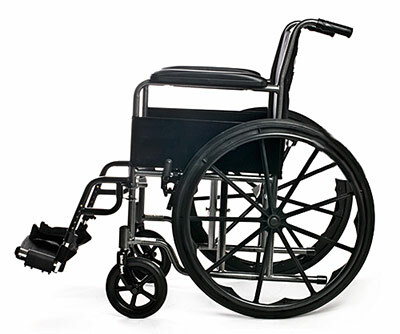 When getting in or out of wheelchair, do not stand on or apply weight to foot rests. Before reaching or leaning forward, rotate casters to front of the wheelchair engage wheel locks to help prevent wheelchair from tipping over. Do not lean over or apply weight to the top of wheelchair back. This can cause wheelchair to tip over. When trying to extend arms over back, only reach as far as your arm can extend without having to alter your seating position. DO NOT stand on wheelchair.